The terrorist responsible for the New Year's Eve attack on Reina nightclub in Turkey that left 39 dead has said his purpose was to "kill Christians" as an "act of revenge." During a hearing earlier this week, Abdulkadir Masharipov, who was captured on January 16, told a court in Turkey that he was a member of Islamic State, which had defined the massacre as revenge for Turkish military involvement in Syria. However, Masaripov he did not consider his actions as an attack against the Turkish state, but rather “believed it was an act of revenge against the murderous actions carried out by the world’s Christians, an act of retaliation on their holiday,” according to World Watch Monitor. The outlet notes that observance of New Year’s Day is discouraged by many orthodox Muslims. Masharipov, a 34-year-old Uzbek who speaks four foreign languages, also said he had expected to commit suicide in the attack, rather than submit to capture. He told the court he did not regret what he had done, and said he hoped he would be given the death penalty. During his 7-minute rampage, the militant killed a total of 39 revelers and injured 65 more. Twelve of the victims were Muslim Turkish citizens, but the rest were foreigners from India, Morocco, Jordan, Canada, Russia, Tunisia, Saudi Arabia and Kuwait. However, there were few, if any, known Christians among them. Masaripov reportedly shot his way into the nightclub and opened fire with an automatic rifle. He reloaded his weapon several times and shot the wounded as they lay on the ground. Following the massacre, he avoided capture for more than two weeks until tracked down in a police raid in Istanbul’s Esenyurt district. His accomplices, a man of Kyrgyz origin and three women, have since been arrested. Turkey is 99 percent Muslim, according to official estimates, though the country’s constitution defines it a secular state. According to the U.S. State Department’s International Religious Freedom Report, the rights of minorities, such as Greek Orthodox Christians, Jews and Armenians, are limited. The State Department estimates there are approximately 7,000 Protestants among Turkey’s 75 million residents, and law enforcement authorities view Christian proselytism with suspicion, reports RNS. 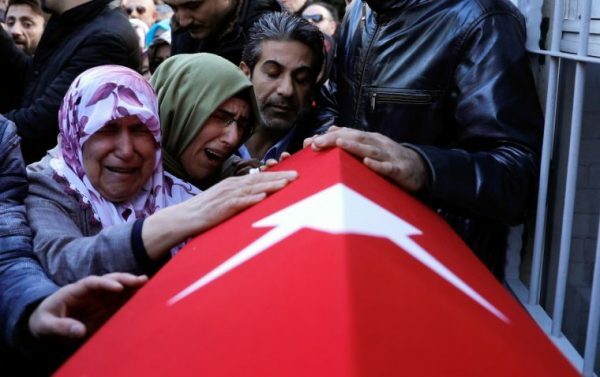 In its annual Human Rights Violation Report for 2016, issued 30 Jan., Turkey’s Association of Protestant Churches noted a “marked increase” in hate speech against Christians in national, local and social media during the past year, including attacks against Christmas celebrations. The country is ranked #37 on Open Door USA’s World Watch List of 50 countries where Christians face the most persecution.